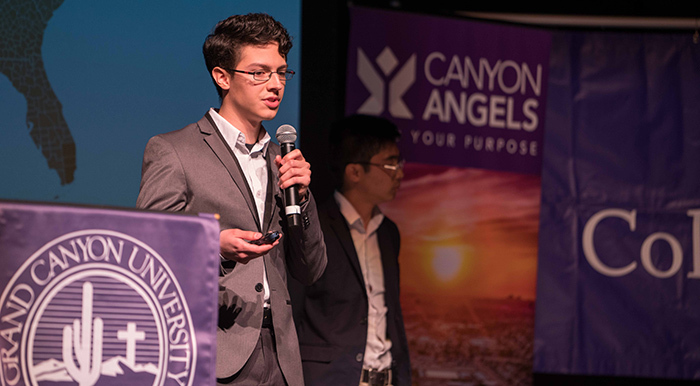 The Canyon Challenge, Grand Canyon University’s annual entrepreneurial competition, is evolving. And spawning a new event. When five entrepreneurs vie for the $10,000 in prize money at 4:30 p.m. Wednesday in GCU Arena, they’ll be doing so from a position of strength. All five businesses aren’t just an idea – they’re fully in motion. The five finalists in the competition, which will be streamed live on GCU TV, includes one of the members of the team that had the winning entry last year, Storage Together. This time, Josh McGuire has created Prophet Insight, which uses artificial intelligence to provide location-based data analysis for small and medium-size businesses. The information can include things like census data, energy consumption, traffic patterns, tickets, water consumption, waste, rainfall, weather. 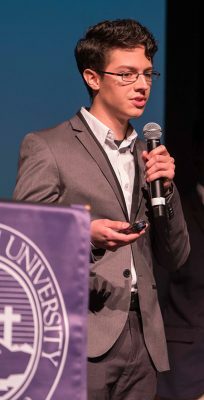 Jedidiah Woods, also a finalist last year with his Secure Together idea, has another new company, Thoreson Watches, which aims to raise money for the tutoring and mentoring of refugee children. Also among the finalists is Elroi & Men, the bowtie company formed by GCU alumna Andrea Northup to aid Native Americans in South Dakota who have been wrought with poverty. It was profiled last August in GCU Today. The other two finalists both are first-timers, and one is a freshman. That would be Austin Diering, who has created CheerFizz – energy drinks for cheer teams. Engineering student Westin Smith saw what Levi Conlow and Nathan Cooper were doing on campus with Lectric Longboards and created Lux Longboard Rentals, which rents electric longboards and scooters. It sets up to be an interesting afternoon Wednesday as the five entrepreneurs try to impress the judges, but this year it’s the prelude to two big new events in GCU Arena. At 2 p.m. Wednesday, April 11, Kelley will conduct an Angel Investing seminar, designed to attract new investors. It will be followed at 4 p.m. that day by the first AZ Conscious Capitalism Collegiate Challenge, in which student teams from colleges all over the state will pitch to business leaders for more than $40,000 in prizes. It’s all part of the scope of entrepreneurship opportunities at GCU, which include the monthly Sharknado Tanks. “Every entrepreneur at GCU, whether they’re part of the Canyon Challenge or not, should be part of the Sharknado Tanks and a part of the IDEA club because they need to be building their business to compete in each of those competitions to get the perfection they need, the exercise they need, the practice, the clarification of their concept and hopefully win some money so that they can actually execute on their business plan,” Kelley said.